TL;DR: yes, it’s a real photo, and it CAN happen to you. Hay Chix explains how, and how you can easily avoid it! If you were anywhere on the internet in the past week or so, chances are some version of this photo plus a funny caption came across your newsfeed (probably multiple times). Now, 99% of equestrians know that they too have dealt with random predicaments like this at some point in their life, but naturally 1% of observers totally wigged out that for some reason, the owner of this horse had intentionally put the animal there. Rest assured, they did not. 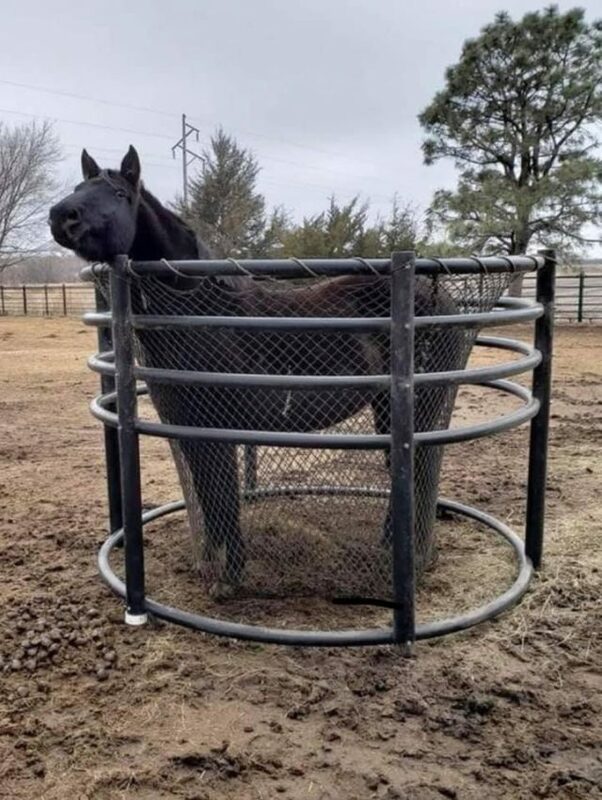 Horses, as we know, are really good at finding elaborate ways to make trouble, and indeed, this horse put himself here. The truth behind the 'unsolved mystery' going around on Facebook!To all those concerned: we spoke with the owners of the curious horse and she came out without a scratch ? There you go! Horses WILL discover ways to get themselves in a pickle even if the opportunity only exists for a moment. Keep your eye on those tricky little boogers, and stay safe out there. Shout out to reader Lynn H. for sharing this video with us!